Everyone knows seventeen-year-old Grace Foley is a bit mad. She’s a prankster and a risk-taker, and she’s not afraid of anything—except losing. As part of the long-running feud between two local schools in Swanston, Grace accepts a challenge to walk the pipe. That night she experiences something she can’t explain. The funny girl isn’t laughing anymore. She’s haunted by voices and visions—but nobody believes a girl who cries wolf. As she’s drawn deeper into a twenty-year-old mystery surrounding missing girl Hannah Holt, the thin veil between this world and the next begins to slip. She can no longer tell what’s real or imagined—all she knows is the ghosts of Swanston, including that of her own mother, are restless. It seems one of them has granted her an extraordinary gift at a terrible price. Everything about her is changing—her body, her thoughts, even her actions seem to belong to a stranger. Grace is losing herself, and her friends don’t understand. Is she moving closer to the truth? Or is she heading for madness? 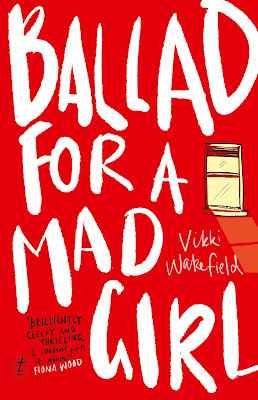 ‘Ballad for a Mad Girl’ is the new young adult book from Australia author Vikki Wakefield. Vikki is one of my favourite authors writing today. Hands down. I have loved all of her books, and even though Ballad marks the biggest departure from her contemporary backlist – it’s another one of hers that I’ll cherish and count among my new modern, Aussie YA favourites. Where as in the past Vikki has written very gritty, realist teen narratives – Ballad is a bit of a horror/speculative-fiction change-up, in which protagonist Grace Foley finds her body inhabited by the ghost of a teenage girl who died tragically, decades ago. Grace finds her ghostly companion after a death-defying school challenge goes horribly wrong, and in the midst of her deep-seated grief over the death of her own mother a year ago. Now Grace’s dog is wary of her and biting mad, she of – zero artistic talent – can suddenly draw haunting portraits, and there’s a girl always standing in the corner of her room at night. Even though there are horror and gothic threads in this book, long-time fans of Vikki’s should know that they’re still getting a gritty novel from this beloved author who is celebrated for her gut-punching YA – because she knows that speculative-fiction without relatable backbone means nothing. Vikki takes the haunting and uses it as an extension of Grace’s grief and denial over her mother’s death, as well as her uneasiness over growing up and apart from her core group of friends. There were times when I felt like maybe there were one-two-many metaphoric ideas happening – between the death of Grace’s mum, and her friendship dramas, as well as Grace’s own mental health questions – but by the end all of these narratives were bought together rather neatly for a satisfying, if haunting conclusion. Vikki Wakefield is one of the most creative and daring authors writing for young adults today. Ballad for a Mad Girl is an Aussie YA Gothic tale that smartly uses the supernatural to explore the depths of grief and growing up, and the pain to be found in both. This is a caring and keening novel, creepy but tender and wholly marvellous. Tanner Harding can tame a monster bull with ease, but he never expected to be floored by someone like Evie. Sparks fly between them until injury threatens to end Tanner’s career –and suddenly he’s the one in need of a rescue. Evie can’t turn her back on her wounded hero and, as Tanner struggles with his recovery, she’s not sure she can guard her heart against him either. Tanner knows Evie has slipped under his skin, but she lives in Australia and his future is under a cloud. Can two people with too many reasons to walk away make the bold decision to stay? ‘Tanner’ is the first book in a new alternate-writers series from Tule Publishing, called American Extreme Bull Riders Tour – and this first instalment is written by Australian romance author (and one of my fave-of-faves!) Sarah Mayberry. Now, cowboys are not really my thing. Every romance reader has their trope-of-choice; and cowboys just aren’t mine. My bestie is all about the ice-hockey players, while I’m more of a Scotsman in a kilt kinda gal … but the whole Western Romance/Cowboys/Bullriders thing has just never been on my radar. Until now. The series starts out with 25-year-old naïve Evie, flying all the way from her family’s farm in Australia to Tulsa in America, to be with her long-distance boyfriend (and childhood crush) Troy, on the last 2 weeks of his Extreme Bull Riders circuit tour. But when Evie arrives she’s met with the shocking realisation that Troy hasn’t been anywhere near as invested in their relationship as she was – and has in fact been bedding buckle bunnies for the months that Evie was pining for him and planning her grand-gesture surprise arrival. The one person to witness the full-force of Evie’s uncovered betrayal is Troy’s opponent on the tour, Tanner ‘Hard Man’ Harding – a famous Bull Rider tipped to win this circuit. Against his better judgement, Tanner is moved by Evie’s plight – and impressed with her stoicism in the light of such betrayal. He rescues Evie from a seedy motel, and insists she take the spare bed in his Hilton hotel room – and stay with him for the few days it takes her to sort out a plan for the two weeks she’s stuck in America on a non-refundable plane ticket. But pretty soon Evie is forgetting all about Troy and her heartbreak; so focused on the kindness and gruff compassion of Tanner, not to mention an impressive body crafted from years on the Riding circuit. Tanner, for his part, quickly becomes infatuated with Evie – her iron-will, and sweet disposition – and the two of them fall into an intense and loving fling that only grows stronger when an accident forges a friendship in the fires of tragic circumstances. There was a small silence, but as he climbed back into bed she blew her nose. Not a delicate little lady honk, either. “Don’t apologize for having your heart broken,” he said. Troy was the one who should be apologizing. Tanner had no problem with anyone taking pleasure where they found it, but trying to have a bet each way struck him as being greedy and more than a little selfish. If Troy wanted to play, he shouldn’t have made whatever promises he’d made to Evie, and vice versa. She blew her nose again, then he heard the sound of her moving around in the bed, changing position. “I think maybe I came to Tulsa to have my heart broken,” she said very quietly. Sarah Mayberry’s Tanner is more of what I love from this auto-buy author. Her characters often start out in the trickiest of circumstances – in this case, Evie getting her heart broken by her childhood crush in the first two chapters! – but the strength of Sarah’s romances is how these character get back up again and find their way to happiness in spite of the worst circumstances. The other thing I love about Sarah Mayberry’s books is that they’re just so darn hot – and Tanner has got to be one of her hottest yet! I said I didn’t like cowboys so much, but Sarah has imbued this hero with a commendable chivalry and tender compassion that’s mouth-wateringly tempting. There were a few times when Tanner could have been seen to come across as He-Man bossy, but when his particular brand of take-charge gruffness was up against Evie’s own iron-will, it only made for a spectacular coupling with a give-take that was so much fun to read! Sarah Maybery is one of my favourite, favourite, favourite romance writers – ever! – and Tanner has just made its way onto my Top 5 faves from her list. Which is really saying something!